Males are more brightly coloured than females. Females also have a different shaped abdomen, only visible on the underside. Must have access to an area above the water line, and prefers brackish conditions, an SG of 1.005 is sufficient. A secure fitting lid is essential as these are excellent escape artists. 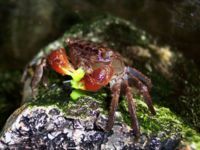 Red crabs are particularly sensitive to copper, which is an ingredient in many fish-disease treatments and snail-eradication chemicals, avoid at all costs. Red Claw Crabs are very good escape artists, and will take advantage of any opportunity to escape from the aquarium they are kept in. They can easily climb up airline tubing and filter tubes, so a tight fitting lid is essential. They can be kept with fish, but it is not a good idea to do this. They will catch and eat small fish if given the opportunity. Avoid keeping them with bottom dwellers or long finned fish at all costs. In a planted tank they will snip pieces off the plants and eat them. Adding a weighted piece of lettuce will allow them to drag it off and graze in private. Flattened deep red/brown shell with protruding eye stalks and 2 equal-sized orange to bright red claws. This page was last edited on 6 April 2017, at 21:35.